How should I do if I deleted recovery partition accidentally? That’s no big deal, just download OneKey Recovery software and re-create new recovery partition. AOMEI OneKey Recovery is good software to do it. My friend Michele learned how to manage computer partition with a third party software, which can let her manipulate his partition in hard disk. When she manages her partitions in computer alone last week, she found her computer has an invisible partition in computer, and then, she deleted it and merged it into drive C. I was surprised when she flaunted to me, because it is recovery partition, which is used to store system image. After knowing that, she was very anxious about it. I have to explain too much about recovery partition to her. I am sure that there are not a few people like my friend. Let me tell you how you should do if you accidentally deleted recovery partition. First, I have to say my friend computer is HP branded computer. Though she is old netizen, but she doesn’t know recovery partition and won’t create it. Recovery partition is used to store the system image for prevent computer crashing. In many years ago, when you buy computer, the recovery disc will be give you with computer. but with the competition of computer becomes fierce, computer producers store system images into invisible partition in computer instead of recovery disc. In computer, recovery software will be preinstalled. If you encounter some problem causing computer crash or system error. You can startup recovery software and activate recovery partition to recover your system. This process is just like reinstalling system. Nearly all recovery partitions with computer brand only can install in their branded computer. Such as Lenovo Onekey Recovery only support to be installed in Lenovo computer. All system images can’t be distinguished by other recovery software. “How should I do after deleting recovery partition accidently”, don’t worry, that’s no big deal if you don’t ask such question while you are encountering computer crash. Yes, the solution is re-make a recovery partition. There are have some ways to tell you. Using built-in function in computer. If you use computer installing Win 8, you use built-in function in win 8. You can select “Create a recovery drive ” in setting, and plug in USB flash drive or DVD/CD into computer. Using the preinstalled recovery software in computer. Some branded computer have configure their own recovery software. Such as Lenovo One key Recovery, Toshiba recovery wizard, etc. due to their standard is not same, of these software, Lenovo one key is better. It doesn’t require users to prepare any external storage devices except installing Lenovo one key recovery. Using the third-party software. Actually, there are a few third-party software aiming to develop it. of all practical third-party software, AOMEI OneKey Recovery is good. It is similar Lenovo OneKey Recovery. The difference between them is AOMEI OneKey Recovery can be installed in all types of PC and computers. Comparing with such ways above, you can found every ways its own feature. but being a user, you have to consider what is most easy and convenient for you to use. Based on this psychology, obviously, the third way is better. Of course, you can select the second way, but most of computer preinstalled recovery software is not different with computer built-in function. You have to prepare some external storage device and you search for some system file, etc. they may take you more time and your problem can’t be solved. Unless your computer is Lenovo computer, or I won’t recommend you to select the second way. The reason why Aomei Onekey Recovery is recommended is that it has the same function with Lenovo OneKey Recovery, but their difference is that AOMEI Onekey Recovery can be installed in all types of computer and PC instead of adjust to specific brand computer. Only two buttons offer you to select. You don’t need to consider how should you do. If you want to create recovery partition, just select “OneKey System Backup” this button. 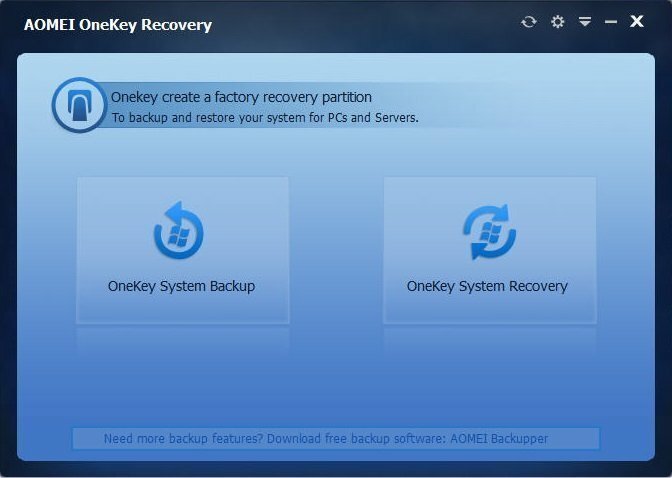 After you have created the recovery partition, and you installed some other applications, if you want to add applications you installed to recovery partition, you can select “OneKey System Backup” again. Here I should tell you that the old system backup will be covered by new backup. Its purpose is to save your computer storage space. As the same rationale, if you want to recover your system, just select “OneKey System Recovery”. All backup and recovery will be finished automatically. Comparing with other software, it does not require you to prepare DVD/CD. If this software is right for you, you can download and experience it.